You only need to skip and dance through the first page before you find yourself straight into a dark narrative not for the feint of heart. You'll be ceremoniously whipped into a murderous storm as you visit Easingford Hall. The plot is a dark maelstrom of treachery, seen through even darker eyes than the devil himself, the new Lord of Easingford, Henry Edgar Easingford. He will stop at nothing to claim the title and wealth that he so desires. The Stolen Secret is a cracking start to a new series from the author of the Olivia books and theatre critic from the Guardian. This is a brilliant story that you will really struggle to put down. It is complex and cunning like the characters themselves. 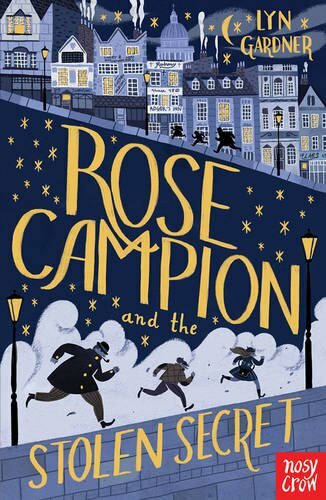 You will easily take to Rose Campion, as she is very determined, lively and head strong, but she has a heart of solid gold. You first meet Rose escaping from the top floor window of Miss Pecksniff's Academy for Young Ladies. Shinning down the drainpipe, Rose will hurtle you into a non-stop adventure of danger, discovery, a world full of crime, colourful characters and MURDER. This book reminded me of the fantastic times that I spent reading Julia Golding's Cat Royal series. In my opinion it is equally enchanting and holds many similarities. It's a historical snapshot of Victorian London with a fantastic theatrical flourish that oozes period charm. When a brilliant young actor goes missing, Rose and her friends from the music hall get on the case and try to solve the mystery afoot. The music hall is a fantastic place to visit, it's almost a character in itself. It superglues the narrative to engaging heights resulting in a brilliant and captivating read. This is another great read from Nosy Crow, a publisher on the rise picking a range of fantastic books and bringing them to the world for readers to enjoy. It is a great start to the series; I will certainly be looking out for the next instalment. Out now.... so what are you waiting for?